Despite of its cringe-worthy lyrics, Meet Bros Anjjan's Shirt Da Button gets on your mind gradually because of its tune. (and I actually, am liking the words now, why can't a love song can be sprinkled with fun?). While Sonu's version is a standard mushy one, Kailash's one with some strings, works better. Techno beats induced Dil Garden Garden Ho Gaya, composed by Sachin-Jigar, works better with full volume, and Vishal's singing. As long as its being played, addictive it is. Shankar-Ehsaan-Loy's 'UP Bihar Lootne' gets a remake. And this time, its an 'all male' affair. Its the original tune that makes it work. And the last one, again composed by Meet Bros., Volume High Karle - is meh. Thankfully with only four songs the soundtrack is average, the soundtrack doesn't harm coz after all its for a senseless movie. Blasting coal mines, mean butchers, seamless weaving of pre/post independance montages, lecherous & humours Biharis, firebrand womaniya, dark alleys of Bihar - everything is just so perfect to the minmum detail. Everything is presented in a way we have rarely seen before. And with finest bunch of the actors, Anurag Kashyap has his handful of the best formula for cinematic brilliance. But, the problem starts when AK goes self indulgent way. No, its not bad to do so, but when it makes the pace suffer, there IS a problem. Gangs Of Wasseypur has its own sparkling moments, but as well as its own flaws that hinders it from being a MASTERPIECE, a document on mafia / gangster movies. The movie starts off in a mind 'blowing' way, literally. But soon you realise, the first scene itself is overdone. You just lose the count and wonder when the gunshots will be stopped. And, surprisingly, after all these bam-bang-boom, the goons don't even care to check whether the task is accomplished ! (No, the 'call' doesn't count). Maybe, 'Bihari' silliness that is. But soon the story goes right on track when it visits the pre-independence era - year 1941, and its a treat to watch the story unfolding in non-traditional way (animation and all) narrated by Piyush Mishra. Train robberies, coal mine labors and bandits. Add Piyush Mishra's songs, it gives altogather gives a different feel. Wonderful use of the song 'Ik Bagal'. 'Bees saal saad' - yes, after 20 years, we meet THE Sardar Kha. 'The' - because the character is SO influencing, you just can't wash it off your head after hours of watching the film. Played effortlessly by Manoj Bajpayee, Sardar Khan is the backbone of GOW. And the rivalary is befittedly played by Tigmanshu dhulia. As Ranadhir Singh, you start to believe he is the ORIGINAL goon and not just a character. But, just when you start enjoying the 'dushmani' - you realise there is lack of tension in this rivalary. Less moments of something concrete happening on the screen, and that too - despite of the fact that there are number of things going on in the narrative. That, confuses the viewer. Even in the second half, the empasis on bigamy of Sardar and too many things going on at Wasseypur and Dhanbad, mars the pace. But again, its a treat to watch Sardar Khan with his second womaniya, Bangalan - Durga. More humour and Bollywood references (that I always love) are there in the second half that without much effort, entertains and holds your attention. And this half has some best scenes of the movie - example - that epic scene where Sardar Khan openly challenges Ranadhir Singh, on megaphone, while playing 'Kasam Paida Karne Waale Ki' in the background. Tehnically, there are no complaints. It's brilliant in all aspects, striking shots (by Rajeev Ravi) of mine blasts, rivers, lakes and 'womaniya's. (nuff to hold your attention). The songs, take the narration forward without much effort, something that AK has mastered, always. But somewhere, it feels bit out of place. For example, while 'Keh Ke Loonga' is being played in background, there isn't much tension on the screen unlike that feel when you just hear the track. There is this one long shot of a jeep passing on the road (numerous of such, actually) and the song is played, wasted. But barring one-two sequences, songs are masterfully used. Womaniya-being the best of the lot. 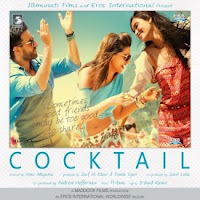 Sneha Khanwalkar's soundtrack is inseparable part of the film. And oh, Womaniya !! Ah, womaniya !! GOW would've never been the same without its Womaniyas. Be it the firebrand Nagma (Richa Chadda) or the sultry Bengal tigress - Durga (Reemma Sen) or the Permission girl, Huma Qureshi. In already crowded Wassepur, they make their own place and leave mark. All of them are part of the finest moments of the film. And epic lines. Lets see where are they heading in the second part. Oh, and in the second part, I am betting on Nawazzudin Siddique. He did not get much screenspace in this part, (but whatever he does, he impresses) but heard he is THE one in the second installment. Can't wait to see more of him. Phew, nuff of all the rambling. This is perhaps not the best from whatever Anurag Kashyap has given till date. Despite length, editing and pace being its issues at places, still there are factors that makes the movie an experience. An experience to remember for its execution, its lavishly large storyboard and the inseperable characters. Gangs Of Wasseypur - is a must watch even if you are not a fan of the genre. Its the LAGAAN anniversary. 11 years and still, the impact is so strong, this, has to be the best movie in my entire life. And how, can I break this ritual, to post about LAGAAN on its release day?? The ritual, that is started by the biggest fan of the film - theBollywoodFan. 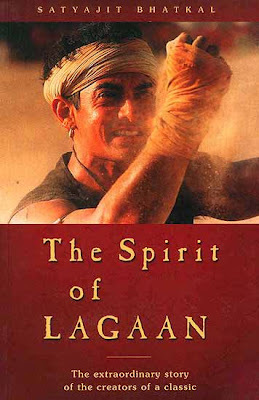 This time, I won't go much in detail but recommendation to watch and read The Spirit of LAGAAN. One of the very first in history of Indian cinema, and undoubtedly the BEST of the lot. Written and Directed by Satyajit Bhatkal (yes the same guy who's directing Satyamev Jayate). The book and the documentary are undoubtedly, rare gems that you must keep in your collections. And, the documentory. 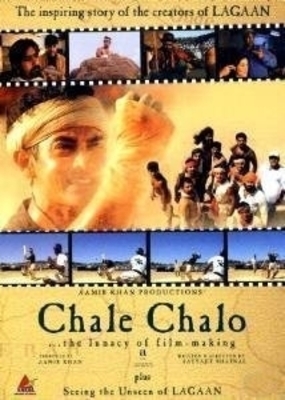 Chale Chalo : The Lunacy of Film Making The story, behind the greatest story ever told. From the concept stage, to the climax, and then after. Satyajit Bhatkal documents everything on screen so seamlessly, that it feels like you are living the story. And after watching this, you fall in love with the LAGAAN all over again. More and more. Need more recommendation? Here's a post by theBollywoodFan, to convince you more. Tell me your own experiences with these two masterpieces. Politics - even this word irks me a lot. And on the other hand, Cinema is the word I love like anything else. And when both of them get together, it always confuses me. Same thing happened with me in this Political Thriller directed by Dibakar Banerjee. 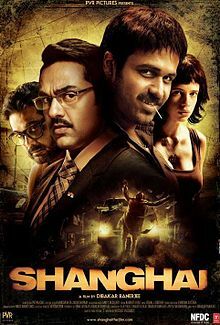 Shanghai - a story of 5 lives, with background of politics and how that dirty thing plays with lives of all five of them. DB does great job depicting a bustling city of Bharat Nagar, that is often dark and mostly lively. Its Pitobash who gets all attention during the first half an hour. Until you meet Jogi. Jogi Parmar the 'media person' of Bharat Nagar, played by Emraan Hashmi. His, is the best performance in this movie. Even, he leaves (my favorite) Abhay Deol behind when it comes to grabbing attention. Yes, Abhay's character was confusing. Also, underplaying was necessary, still, somehow I feel something was missing there. Don't know why. Prosenjit's character is something I felt, would have been awesome if it had longer screen time. (despite the face, it had to be that short). Oh, and yes, very happy to see Farooq Sheikh on screen again. Talking about Kalki, ah well, to be frank, there wasn't much for her in this movie except running here and there. Why DB? And there, I have complaint for the director. It gets repetitive while tackling issue of the leading lady. No doubt, the movie takes interesting turn later in second half, but that's too late. Till then, the slow pace already does its job. But still, the movie manages to hold itself because of Emraan and Pitobash. Not to forget bit of humour sprinkled at moments. The climax looks hurried, and doesn't make much impact. A typical resolution is provided while there was a scope for something unusual. And despite of those glitches, the movie manages to hold you with it while its going on. And there ARE a few moment that stays with you after leaving the hall. This might not be a cult classic, but definitly worth a watch. What makes 'Tumhi Ho' - different then any usual Pritam-Neeraj song, is the female lead, Kavita Seth. Add the sticky tune and the loop inspired by age old chant, 'Tumhi ho bandhu, sakha tumhi', this is one is a helluva track. Starting off with familiar guitar strings, Benny and Shalmali makes addictive mix of 'Daaru Desi'. Rock version of Yaariyaan, makes you fall for it instantly. Be it for the lyrics by Irshad, or the fab vocals of Mohan & (late, yet superb entry of) Shilpa Rao. The track totally absorbs you. So, is the reprise of the song, sung by Sunidhi and Arijit. Interesting swap of singers in this version compared to earlier. There is another track where lyrics are a highlight - Luttna. Sung by Masuma Anwar, Sahir Ali and Anupam Amod, its an innovative mix of sounds and wonderful words fused with fantastic vocals. During the second interlude, it takes interesting turn. Second Hand Jawani, is a glitch though.Despite of fun lyrics, it fails mostly cause of the false arrangements. And, there - we have two Coke Studio connections. First one being the singer Javed Bashir, accompanied by Nikhil and Shefali in Tera Naam Japdi Firaan. The powerful vocals does make this pop'ish track a 'stuck in head' one. Lastly, Arif Lohar's Jugni which featured in Coke Studio Pakistan, gets re-arranged by Pritam here. Though not much changes in terms of tune, the female voice is changed to Harshdeep Kaur, and that's where I am complaining. Barring that, it still makes a worth inclusion in the album. All in all, Pritam is on a roll this year, churning out hits and more hits. There is surely something about Saif's 'mushy' movies and Pritam - together, they both work perfect. My Picks : Luttna, Yaariyaan, Tumhi Ho. The title track, sung by the Bachhans themselves, with silly lines uttered by the leads, is interesting, engages you into it. Maybe its Big B who makes it worthwhile. Next Chalao Na Naino se baan re - is a pure 'Himesss earworm'. Though too outdated it may sound, it surely will be fun to see Ajay moving his feet on screen. Nach Le Nach Le starts well but soon the percussion takes over and you know this is another version of Ajay-Atul's own hit earlier this year. Quite okay. Was expecting something comendable from Jab se dekhi hai because of the singer - Mohit Chauhan. But the underwritten loop makes it incomplete.